We must select the File tab to move to Backstage View as shown in the image below. Once in Backstage View, from the drop-down menu at the left of the left we select the category Publish as shown below. Once we select the Publish category, in the middle and under notice we can see the command Publish to Power BI. At the right and under Publish To Power BI, we are informed with the following: Use Power BI To Create And Share Rich Visual Reports And Dashboards From Your Workbook. We can also Select Where We Would Like To Publish To In Power BI. If we want to change the location of the folder, we select the drop-down menu in order to change it. All we need to do is to press the Upload button at the left of this area as shown in the image below. All we need to do is to press the Export button at the left of this area as shown in the image below. The steps that we follow have been described in a previous post of mine that I have mentioned above. We must first log in to our account and then follow the steps. Below you can check out the video describing the procedure of how to Export Upload a Workbook in Microsoft Power BI. 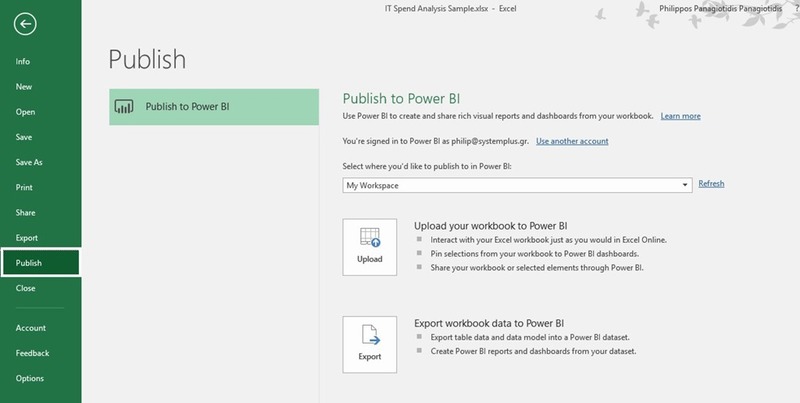 Posted on March 5, 2018, in Excel 365 English, Microsoft Office 365 ProPlus English and tagged Analyze, Create Power BI Reports And Dashboards From Your Dataset, Export Table Data And Data Model Into A Power BI Dataset, Export Workbook To Power BI, Interact With Your Excel Workbook Just As You Would In Excel Online, Microsoft Excel, Microsoft Office, Office Smart, philippospan, Publish, Publish to Power BI, Select Where We Would Like To Publish To In Power BI, Share Your Workbook Or Selected Elements Through Power BI, Smart Office, Subscribe, Transform, Upload Export Workbook To Microsoft Power BI, Upload Your Workbook To Power BI, Use Power BI To Create And Share Rich Visual Reports And Dashboards From Your Workbook, Visualize, Workbooks, YouTube. Bookmark the permalink. Comments Off on Upload Export Workbook To Microsoft Power BI.